The Award winning THE BOOK OF BIRDIE hits VOD today and it's a strange trip into a a dark fairy tale realm. Birdie is a teenage girl who bleeds mysteriously. Her grandmother is unable to care for her and leaves her in the care of the sisters in a convent. There she makes the acquaintance of the daughter of the groundskeeper. Things begin to go weird when the convent is suddenly slated for closing and choices have to be made. One of a kind fairy tale is full of emotion and unease. 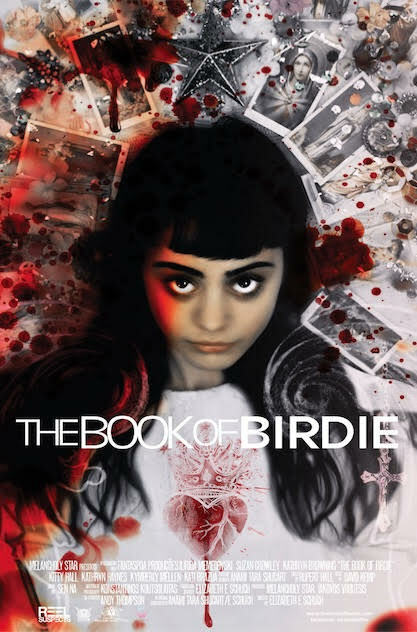 Thanks to stellar filmmaking and a perfect use of Catholic imagery THE BOOK OF BIRDIE is one of the most uncomfortable films you'll see all year.As the film goes on the cool imagery such as the hanging nun that Birdie talks to goes from that's cool to some how disturbing. The universe of the film, no matter how cool it looks is just really off and it wears us down and gives us nightmares. While perhaps not a film filled with shock scares it it a film that is much more insidious in that it invades our brains and stays with us long after the final credits roll. I saw this right before bed and the imagery drifted into my dreams and haunted me all the next day.